Yarnaholic Molly Pink has become known in Tarzana, California, for her sleuthing skills, thanks to the help of her crochet group. But the latest mystery may be too much for these stitchers to unravel . . . There's nothing the Tarzana Hookers love more than doing a good deed. They're so preoccupied with crocheting and selling scarves, teddy bears, and blankets to raise money for the local park that they don't even notice the brown paper bag at the end of the table-until it's too late to find its owner. Unable to resist a good mystery, they open the bag and find a note that speaks of remorse, a diary entry of the sorrow of parting, and a complicated piece of filet crochet that offers an obscure clue in pictures. 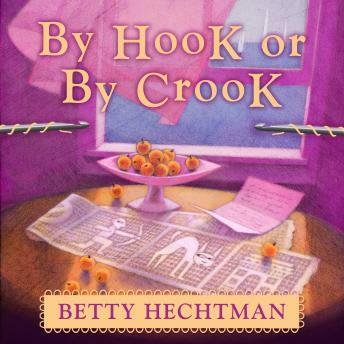 The Hookers decide to leave the detective work up to Molly, but by the time she discovers the talented crocheter's identity, the mystery person has been murdered by a box of poisoned marzipan apples. Now Molly needs the help of her fellow stitchers, before the killer has time to create a deadly pattern of murder . . .